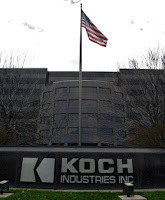 Bloomberg Markets has written a bombshell expose of Koch Industries that is bound to resound through the Brothers' vast conglomerate as much for the platform -- a normally staid financial publication -- as for the information contained therein. "A Bloomberg Markets investigation has found that Koch Industries -- in addition to being involved in improper payments to win business in Africa, India and the Middle East -- has sold millions of dollars of petrochemical equipment to Iran, a country the U.S. identifies as a sponsor of global terrorism." In their piece, "Koch Brothers Flout Law Getting Richer With Secret Iran Sales," Bloomberg Markets details how the Koch Brothers hired and then fired their ethics officer charged with uncovering fraud after she'd uncovered more than fraud. Internal company records show that Koch Industries used its foreign subsidiary to sidestep a U.S. trade ban barring American companies from selling materials to Iran. Koch-Glitsch offices in Germany and Italy continued selling to Iran until as recently as 2007, the records show. Whether this will lead to further investigation or just a wider awareness of the Koch Brothers' tentacles into questionable enterprises, one question that arises from this article and the platform therein is why now? Is it because the Republican "mainstream" -- what still exists of it -- sees the Tea Party funding Koch Brothers as a threat to a more electable candidate than the Koch-supported Rick Perry? Is it because Bloomberg Markets' investigative team are just darn good reporters? (They are). We may never know the backstory on the editorial decision to publish the stunning expose on the Koch Brothers. We know that it didn't come from Jane Mayer of The New Yorker or from Lee Fang of Think Progress, tireless and talented reporters who've tried to bring attention to the Koch Brothers' unprecedented influence on politics and industry. It came from a financial publication. This is not, as the Koch Brothers have argued in the past, a political hit piece from the Left. This time, they must looked to the Middle-Right. There are other questions that arise from the Bloomberg Markets' report that might be worth asking at the next Republican debate of those who've received money from the Koch Brothers: Did any of that money come from their dealings with Iran's Zagros Petrochemical Company, the world's largest methane producer? If so, perhaps those contributions should be returned? The same question could be asked of the many members of Congress, the Republican governors, the state legislators who receive Koch Brothers' contributions and last, but not at all least, the erstwhile Tea Partiers who have hid their head in the sand at the fact that they are being funded by billionaires who'd like to see the Medicare for which they demand protection be dismantled. Don't they need to ask where those funds came from? Do the people who stood up and shouted at town halls after having been bused in by the Koch Brothers' Tea Party organizations need to ask what these guys are after and are they acting in their own best interest by doing their bidding? Questions have been asked by the left and left of center media about Koch Industries for a long time. Now those questions are being asked and answered by Bloomberg Markets Magazine and that is new.